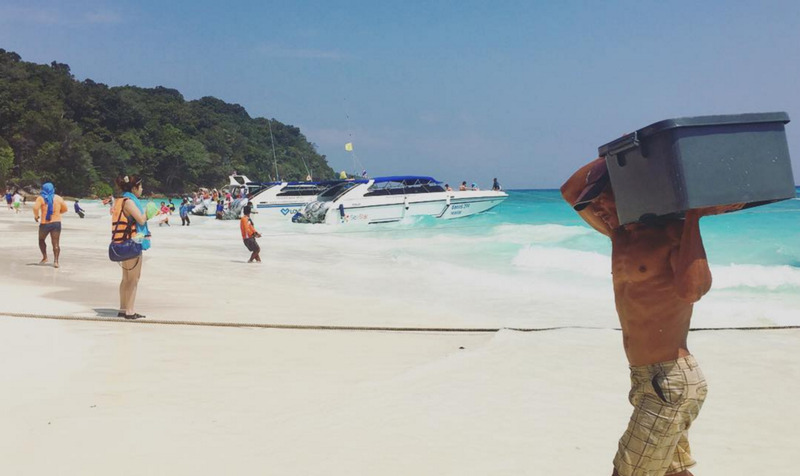 Visiting Koh Tachai was, hands down, the most obnoxious travel experience I've ever had. My disdain for beach culture and tourists was not only at an all-time high, but the larger environmental impact had me fuming. Set a little further from Phuket than the other day-trip islands, Koh Tachai is touted to have one of the more pristine beaches. Clear water, yes, but the numbers of entitled tourists and motorboats they allow in to stomp all over its beauty is heartbreaking. The sell of this remote island, horrible snorkelling, and playing on our need to escape is largely an attempt to convince largely Russians, Chinese, and Euros they'll reach that faux zen moment of their Instagram dreams. In October, this particular island will be closing indefinitely, as tourism has wreaked enough havoc on this part of the world; authorities are finally realizing it's gone past its breaking point. And it pains me, in my long separated visits to Thailand, how I see the country deteriorating as a result of the industry that keeps them alive, not having stricter environmental regulations in place to maintain that, and the "douchebag tourism" that seems to plague a lot of these tropical destinations worldwide. Ugh.